It is a hot Tuesday afternoon and informal waste pickers, those who retrieve recyclable items thrown away by others, approach the recycling yard situated on the premises of the Green House Project on Wolmerans Street, Johannesburg. Placed in a small corner, with an entrance separate to that of the Green House Project, the recycling yard is a beacon of hope to the 392 informal waste collectors that walk through its gate. 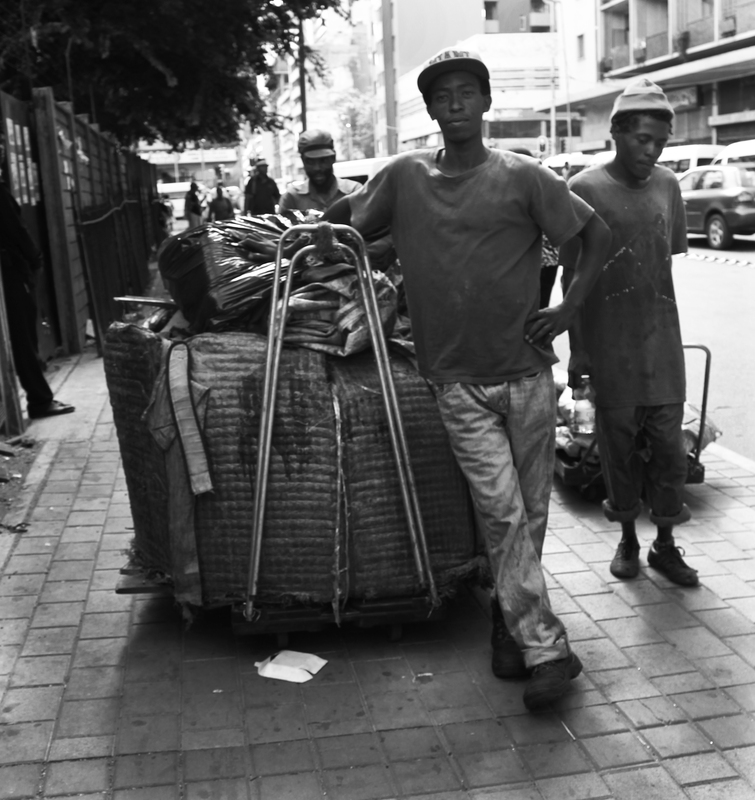 With shoes that have fallen apart and makeshift trolleys, these informal waste pickers walk great distances collecting bottles, plastic, paper, boxes and cans which they sell for a small sum of money. A big blue skip bin is placed in the centre of the yard where workers sort the trash brought in by the informal waste pickers into organised heaps. 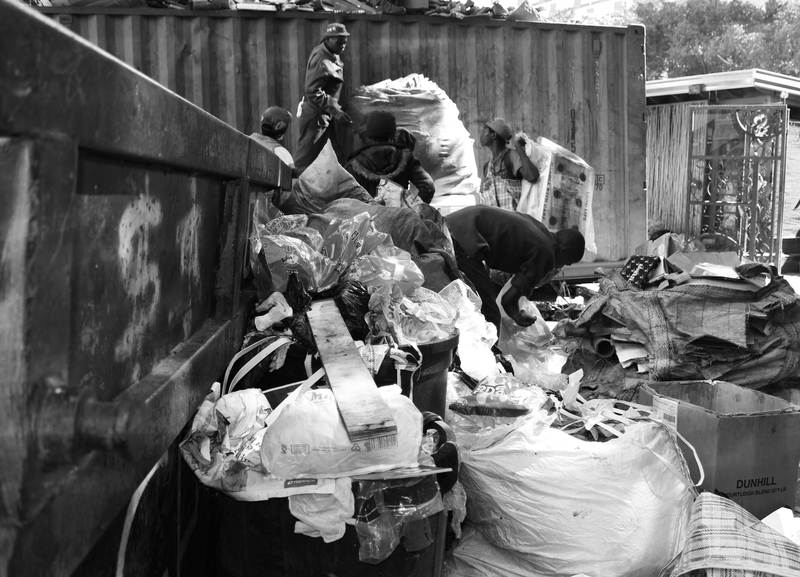 The recycling yard, run by a South African based company called Trash Back, focuses on improving the quality of life of informal waste pickers with the hopes of moving those who are homeless off the streets. Moyo, a friendly and approachable 35-year old, explained that before he started working at the recycling yard, which opened up at the beginning of this year, he was a manager of a restaurant here in Johannesburg. 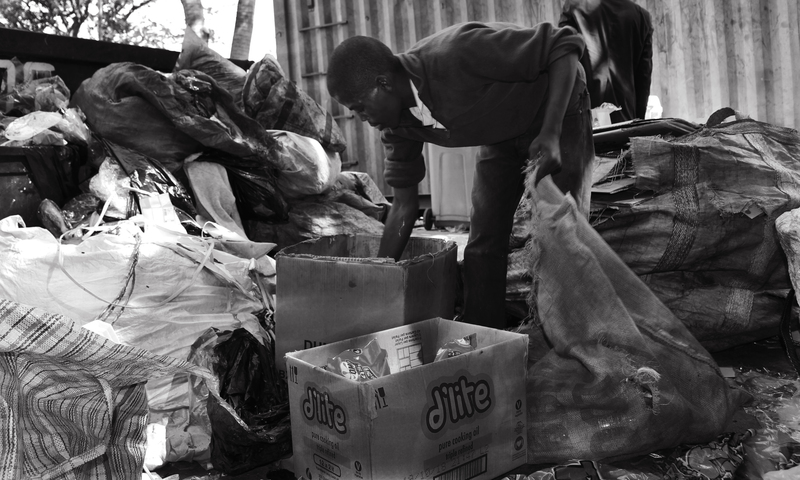 SORTING: A waste picker sorts through plastic and cardboard within the recycling yard. “ I came here because I love working with, let me rather say I love helping people, so when they told me this project will be starting up solely to pull these guys off the streets that’s when I joined,” said Moyo. 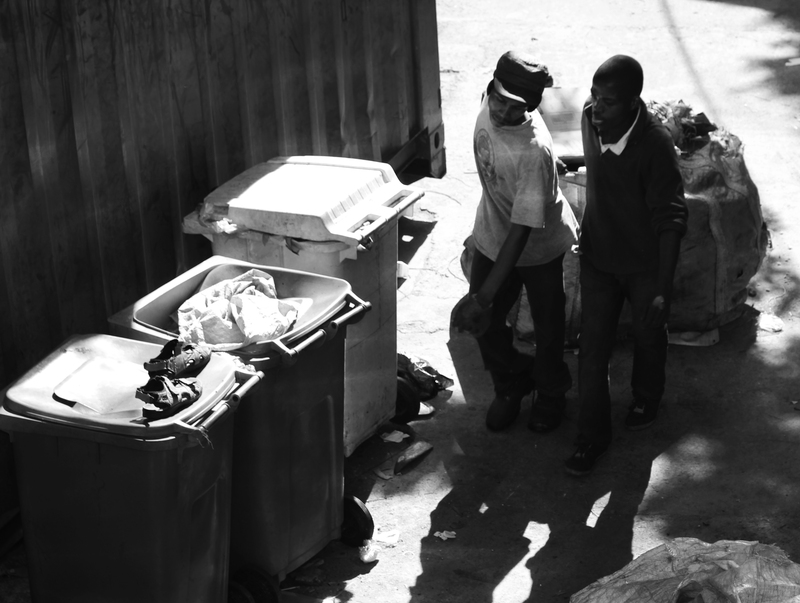 Moyo said that after working throughout the night, waste pickers “come here [to the yard] first thing in the morning”. Moyo said that depending on what is brought in, the waste pickers are “given money, and in return we are given what we need, the waste products”. “They go out and come back much later again to make enough money to buy food and the basics that they need,” Moyo said. “I tell them what items to look out for and what items to collect,” said Moyo and he explained how much the informal waste pickers are paid according to the different items that are brought in. R2.20 per bottle for HD, which are the milk bottles. SORTING: Workers at the recycling yard place the cardboard into a large skip bin. 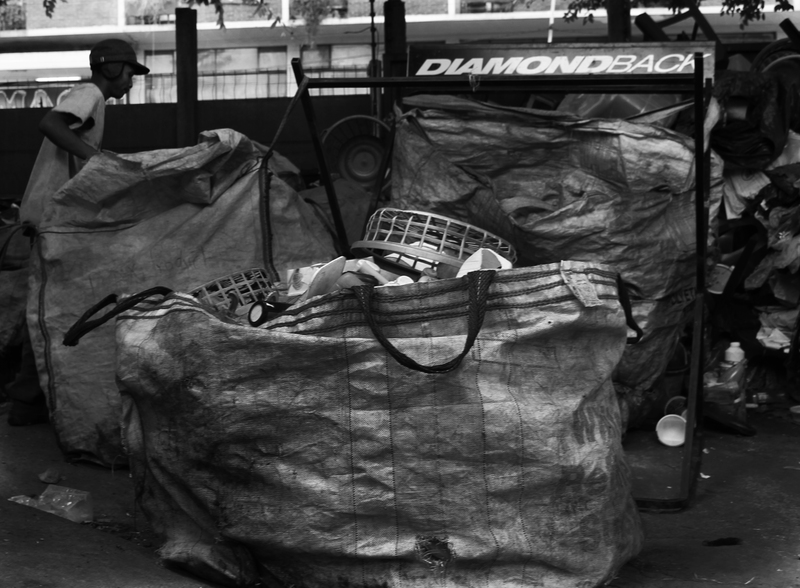 RECYCLING: A worker within the yard sorts through several bags that are filled with recyclable objects. Moyo continued to explain that “the people that help me sort out stuff [in the yard] are people that I got from the streets”. “I saw that they were hard workers and so I pulled them out and now we work as a team where I pay them a salary,” said Moyo. While hiding in the shade of the skip bin from the scorching hot sun that is beating down, *Collins, a waste sorter in the yard, wipes the sweat that drips down his face with the sleeve of his overall. “Let me tell you about the story when Sipho found me,” he smiled. The short, soft spoken 27-year old said: “There was someday where I was at a garage here in Joburg and I was collecting in a bin. He [Sipho] was busy at the petrol station, waiting for people to pour fuel there. He saw me collecting some of the things and he managed to call me. He wanted to get me off the streets,” said Collins. Collins explained that he decided to go and see what Moyo had to offer three weeks after he had been spotted at the petrol station. After seeing Moyo, Collins still worked as an informal waste picker for a few months before he was hired by Moyo to help sort out the items that came into the recycling yard. Collins added that he earned a salary of R1700 per month, by working as a sorter in the yard, where he “manages to pay R400 every second week for a flat at Hilbrow Safari”. Collins shares a small two bedroom flat with a colleague that works at the recycling yard. Collins sleeps on a thin, worn out sponge mattress that is placed on the floor and a few items of clothes hang in a cupboard. Collins is silent for a few short moments before he hangs his head in his hands…“but before that, yoh! yoh! yoh! It was very difficult”, he said. HELPING HAND: A worker helps a waste pickers cart his trolley through the recycling yard to the weighing area. From its discovery of gold in 1886, the city of Johannesburg has been seen as a city of new beginnings with the opportunity of a new life and an abundance of jobs. The vibrant, culturally diverse city life attracts locals and migrants, like a moth to a flame. However not all is gold in Johannesburg as there is a prominent divide between rich and poor, and like most developing countries the unemployment rate is skyscraper high. According to Africa Check, South Africa has one of the highest unemployment rates in the world. Collins who grew up in the location of Hammanskraal, Pretoria, worked in a restaurant Wings in Witbank, before coming to Johannesburg in 2008. Collins said that he came to Johannesburg because he thought that he would be able to find a better paying job. “I find one day I just wake up and I’m lying on the streets, before when I was at home, I didn’t think that one day I would end up on the street”, said Collins . Collins explained that at a young age he got involved with the wrong crowd where he was introduced to drugs and intimidated into committing crimes. Collins said that when he came to Johannesburg he was smoking “crystal meth” and explained that he used the little money that he earned as an informal waste picker to buy the drugs to feed his addiction. 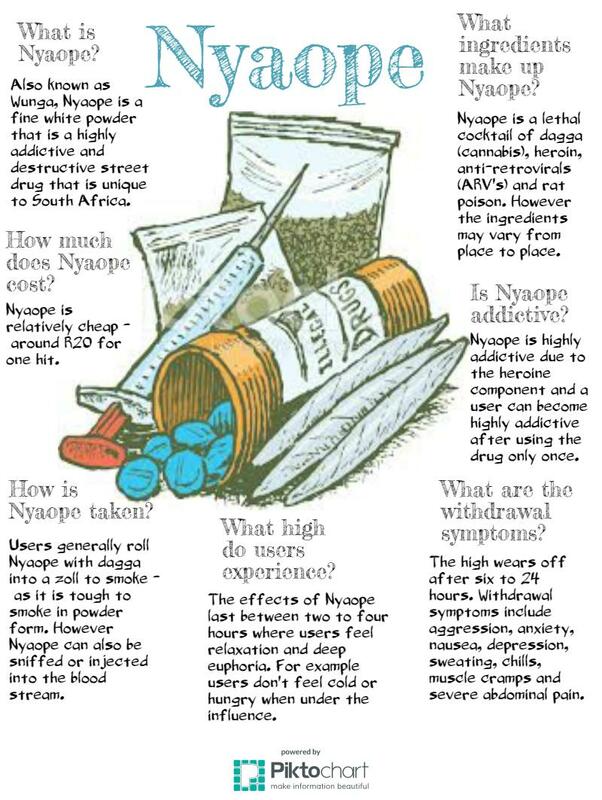 The drug Nyaope is a concoction of rat poison, dagga, antiretroviral medication and heroin and *Jackson, an informal waste picker who currently lives on the street said that Nyaope was a common drug that is found on the street. Jackson a tall and slender 33-year old said that “most of these guys they have a problem on smoking, yeah, this Nyaope”. “It’s a terrible thing that they do just for the fun of it and at the end its killing them. Some even go to hospital” said Jackson. “They spike themselves with this Nyaope, with injections that they get from the pharmacy”, Jackson said. Jackson said that he too used to smoke Nyaope but explained “you see, now I see my life is going down the drain, nothing is going fine. I’m not free, I’m always stressed, you don’t know what to do and you all mixed up”, said Jackson. “I see, no man, the more I smoked the more I get this problem, but now since I quit[ in 2010] my life now I can see where I’m going”, Jackson said. Collins too said that he no longer smokes drugs and added that “there’s no big proper rehab centre that I haven’t been to”. “I’ve been to Bronkhorstspruit, Magalies. I’ve been to Brakpan, Springs, Witpoort Care Centre and I’ve been to one in Pretoria” said Collins where “I’ve been in for eight months in each of them” he added. “I don’t know what would happen today if I was staying on the street”, said Collins. “Even all the crimes I’ve done. I’ve been to prison you see and that’s why I needed to get off the street, cause that’s the problem I don’t want to do all those things again” Collins said with a croak in his voice. Collins explained that in 2014 he was involved in a house break-in in Boksburg after which he was locked up for two years, “but even today I am serving my parole,”said Collins. “I got out of prison last year,” Collins explains and adds that “it was hard in prison, but I managed to pick up from there just being alone. Even the people I was going there [to the house break-in] with, they are big criminals, even the ones that make the murder and violence it was not nice…I don’t want to go back there [to prison],” said Collins. Collins said he doesn’t have many friends and that he is not a “friend person”. “The reason for me just to be in jail and smoking drugs is because of friends, so that’s why I don’t want friends,”, said Collins. Jackson, in a separate conversation to Collins, also brought up the fact that the streets are very dangerous to live on due to crime. “Sometimes you meet those guys that rob you of your things,” said Jackson. He leaned against the wall and said “two of my friends, in the past two weeks, they got burned and set alight,” said Jackson. Jackson said that it is very hard to live on the streets, especially in winter or on cold nights. Jackson stated that his one friend made a fire to keep warm and “was smoking rock when he fell asleep and then he leave the fire and it just catches everything,” said Jackson. 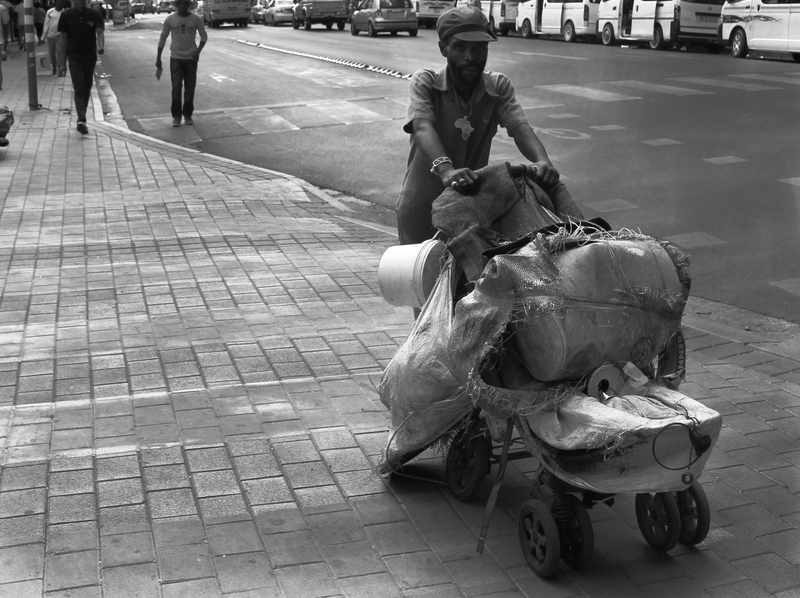 ANOTHER DAY’S WORK: A waste picker pushes his trolley towards the recycling yard where he can exchange goods for a small amount of money. Both Jackson and Collins say that they are grateful for the recycling yard. Even though there are others down town, “this one is the best,” said Collins. “They friendly, they work nicely with people you know. You can even borrow money and we have some showers where we can bath here everyday,” said Jackson. Jackson explained that he completed his first year of mechanical engineering at Witwatersrand University. However could not complete his studies as the people who paid for his education could no longer pay for him anymore. “I’d really like to go back to school,” said Jackson. “If I find a good job with enough money I can go back to school because living on the streets, and doing nothing, is not easy,” Jackson added. Collins said he hopes to keep the job at the recycling yard so that he can send money home to his only other living relative, his grandmother, who lives in Boksburg. “You know your life it is what it is, if you look at the things you know what happened in your life and in your future – there is still opportunities out there,” Collins smiled.